My Timney got stuck this weekend. I had a dud cartridge, and when I extracted it, the bullet got stuck in the rifling and loose powder flew everywhere - including inside the Timney. Now the sear does not go all the way back and the safety cannot be engaged. I will take the gun apart today and clean the Timney. I read your post and began smiling as I understood what happened . You don't have a Timney problem , Johann . You have a "Jamming the bullet" , problem . Some "F-class" shooters experience the same issue of pulling the bullet out of the cartridge , if a "Check-fire", or cease fire is called during shooting . Don't know what bullet you are using , but you might try seating your bullet .015-.020 ( thousandths ) off of the throat to eliminate that problem in the future . I do not "Jam" any of my loads for competition . I believe it causes excessive pressure spikes , and is hard on both chamber , and barrel life . And the majority of the top American competition shooters do not "Jam" bullets , either . The Timney factory is just a few miles from my home , and I stop by there occasionally . One of their techs told me the best way to clean your trigger was to wash it out thoroughly with old fashioned lighter fluid , and blow it dry with low pressure compressed air . Do not lubricate it afterwards . Leave it dry . Hope this helps you out . It was a Timney problem, because it was the Timney that jammed. The lot of cartridges was loaded very short (8 gram bullets) and there was this one anomality among them. I checked the casings - all primers had said pop. So the powder just had not ignited for some reason, and the primer had enough oomph to send the projectile to the rifling. It had rifling marks about 2mm long on its sides. I would guess - moist powder or blocked flash hole? I took the stock off and sprayed the timney with wd-40 and pressurized air without taking it apart and it started working within seconds. PS. I also noticed why my accuracy had went to heck lately - the front attachment point to Archangel stock did not have the shim I had made for it. The barrel was no longer free floating and touched the stock unevenly here and there. Probably forgot to put it there last time I took the gun apart. I made a new shim so I'm hopeful everything is fine now. Look what I found clogged in a casing. Moist powder - green and ruined. Hmmmm If your powder was moist it means your weight measurements were off as well. However a bigger concern is if it is moist powder how are you storing both your bullets and your cans or jars? 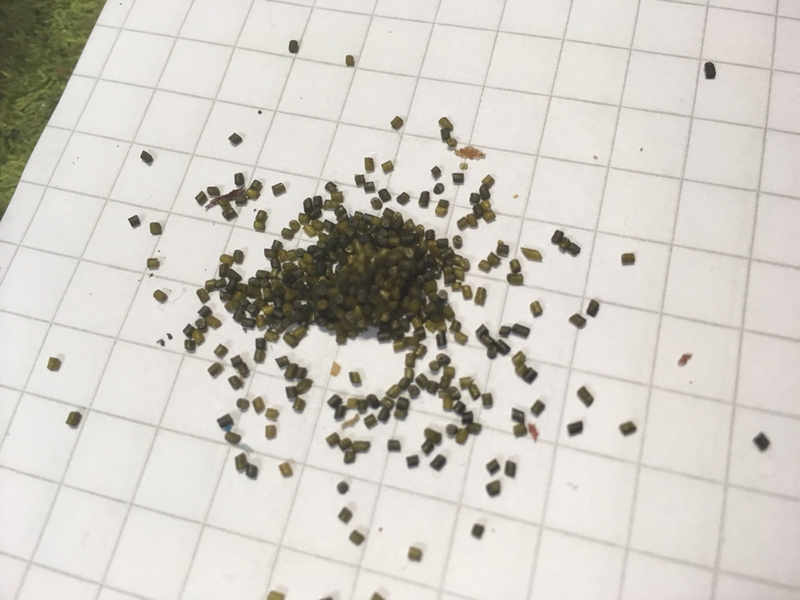 The other thing could be when you reload your bullets the insides are not completely dry, that is if you clean them in a tumbler or an ultrasonic cleaner. Wet primers could also be a result of the above condition. There is also a condition I've seen where there is oil contamination on the powder or primer. Do you use gloves when and if your touching the primers to seat them? Oil contamination will cause them to deactivate. I would throw the entire trigger into a sonic cleaner. Would get all the insides squeaky clean. Interesting happening too.